The DeLonghi DEC180E Dehumidifier is a medium to large capacity dehumidifier with a maximum water extraction capacity of 18 litres every 24 hours. This dehumidifier is suitable for medium to large areas and is equipped with a facility for low temperature operation which means that it is suitable for use in cooler areas, including garages. The DeLonghi DEC180E Dehumidifier has an adjustable humidistat which allows the user to pre-set the level of relative humidity required. Once this has been set the appliance will simply maintain the preferred level, cycling on and off as required. This feature saves energy by ensuring that the dehumidifier is only working when necessary. A setting of 60% will be sufficient to ensure that home contents are protected from water damage but a setting of 50% will be required to minimise dust mites which are a major source of allergens. 50% is entirely comfortable for most people and the humidistat prevents the dehumidifier from drying the air to a point where it becomes uncomfortable. The DeLonghi DEC180E is also equipped with an electronic defrost system which enables the dehumidifier to operate at temperatures as low as 2°C which makes the appliance suitable for low temperature environments such as garages. Without this device a dehumidifier's refrigeration coils become covered in ice at any temperature below around 18°C and the machine will stop until the ice has melted. The DEC180E has two special settings. One in an Eco Setting for minimising energy consumption and the other is a Laundry Setting at which the dehumidifier works harder so as to speed up the indoor drying of clothes. The dehumidifier is specially protected to resist damage from water splashes and very damp air to make it suitable for use in dedicated laundry rooms. The DeLonghi DEC180E Dehumidifier is a quiet dehumidifier with a maximum noise output of 44dB. It is also portable weighing only 15 kg and equipped with both a carrying handle and castors for ease of movement. For those who dislike the chore of emptying the water collection container there is the option of using the continuous drainage capability of the DEC180E. A drainage kit is provided which allows the user to run a small plastic pipe from the appliance to a convenient drain or other outlet so that the water may be discharged as it is collected. This drainage system works using gravity so the drain must not be higher than the dehumidifier and you may find it necessary to raise the appliance one or two feet above floor level to make this fully effective. 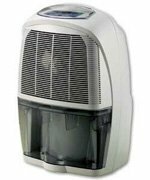 Other features of the DeLonghi DEC180E Dehumidifier include two fan speeds and the option to run the fan without the dehumidification function in order to pass the air through the air filter in the appliance to capture dust and other particles. Consumer reaction is generally positive with no complaints about effectiveness, some about noise, a few about defects. Taken as a whole most would recommend this product to a friend or family member.